Let Fun New York find you all types of cool day trips for couples in New York, where you and your loved one can spend an afternoon to remember! Find romantic day trips in NY that you are almost guaranteed to enjoy! Enjoy a Beautiful Couples Day Trip on the Seneca Lake! Enjoy a wonderfully romantic day trip in New York when you embark upon the Rose Lummis dinner and tour boat at the Port of Geneva. 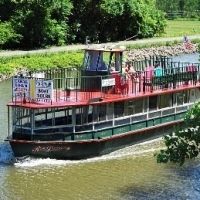 The 49-passenger boat allows you to tour the Seneca Lake and is available for parties, weddings, and day cruises. One of the several specialty packages offered is the lunch at Belhurst Castle. Enjoy a delicious buffet lunch that's complete with an array of delicious entrees and desserts. Your host will entertain you with stories of the castle's extensive and varied history, including being used a speakeasy during Prohibition. Other specialty packages include wine tasting and Montezuma wildlife cruises.